Spring is here and my thoughts turn to flowers. Ellen Hutson’s April Challenge is to create a project combining any products from the Essentials by Ellen and Lawn Fawn product lines. 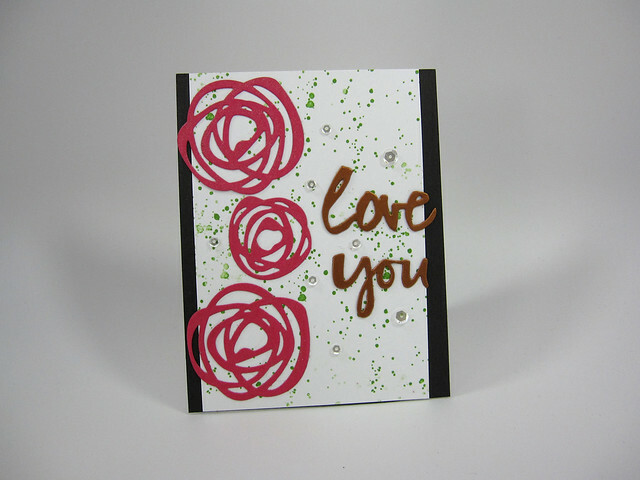 The card above was made using floral stamps from Essentials by Ellen’s Bold Blooms and Lawn Fawn’s Petite Florals stamp sets. I love the simple graphic flowers from these two sets and thought they might look good together. I started off using the largest bloom from the EH set and then started adding additional flowers and leaves. I chose ink colors that I like for Spring and Easter which are usually light purples, bright pinks and a spring green. The card front was trimmed down to 4” x 5.25” and was mounted onto a 4.25” by 5.5” piece of purple card. The whole thing was then glued to a 4.25” by 5.5” top-folding card base. Stamps: Essentials by Ellen: Bold Blooms, Lawn Fawn: Petite Florals. Inks: Memento dye inks in: Sweet Plum, Lilac Posies and Pear Tart; Hero Arts Mid-tone Shadow ink in Bubblegum; Versamark ink. Cardstock: Neenah Solar White 80 lb. for card front; Bazzill cardstock in Pansy for the mat for card front; Neenah Solar White 110 lb. for the card base. Dies: Hero Arts Classic & Ornate Frames die set. Other: WOW Metallic Gold Rich Pale embossing powder; Pretty Pink Posh: Metallic Gold sequins.